This is a book with no words, just numbers. Really, I’m not kidding you. It’s avant-garde you see. A piece of art. Only numbers. And it’s over a hundred pages long. How can a story be told with just numbers? Well, I won’t give too much away, but Dan Holloway has achieved the impossible. 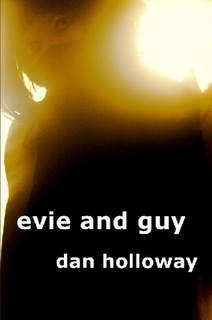 Because after reading Evie and Guy, I really did have a story in my head. Parts I skim read; other parts I studied for longer. I’ll admit: the fact that I read it like this was cheating, and lazy. But if it put a story in my head through my undertaking of such an act, then think what it could have done if I’d read it properly, in detail, one chapter at a time. When I do eventually go back for a re-read, then that’s what I’ll do. A chapter a day, studying every number carefully. Because there is a story in all of them. To read this book for long periods of time, however, would give you a headache – you are only looking at numbers and interpreting the meanings behind them – despite it being a simple code, and easy enough to understand. My other criticism is that like many pieces of art, I’d enjoy it more it was fully explained to me afterwards. I found that after reading and pondering over the story somewhat, I began to think of different ways to decipher what I’d read, and the ending especially is, in my opinion, open to interpretation. But the fact that it got me thinking so much is a remarkable achievement. In summary, there is a lot of story and a lot of depth to this piece. And it’s a very clever idea. But it’s a novella that makes you do the work as you’re filling in the blank spaces, which isn’t exactly relaxing, enjoyable reading. Not a book for curling up next to a roaring fire, that will sweep you away on a thrilling journey … but worth a look. As with all of my reviews (and as you can most likely guess) this is an independent release, published by 79 Rat Press. It’s available in kindle and paperback.